This is part 2 in a three-part series about my trip to San Francisco to visit Maker Faire Bay Area. 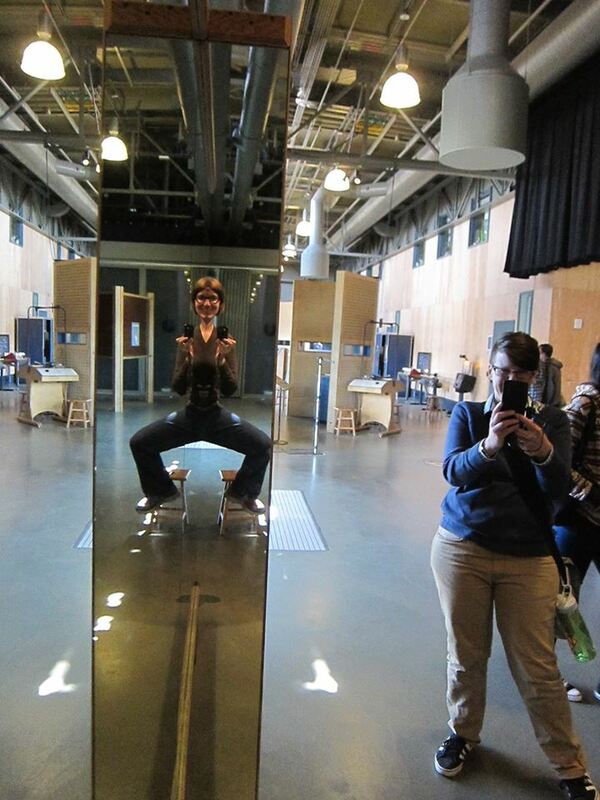 I also write about our visit at Lick Wilmerding High School and Maker Faire Bay Area in separate posts. 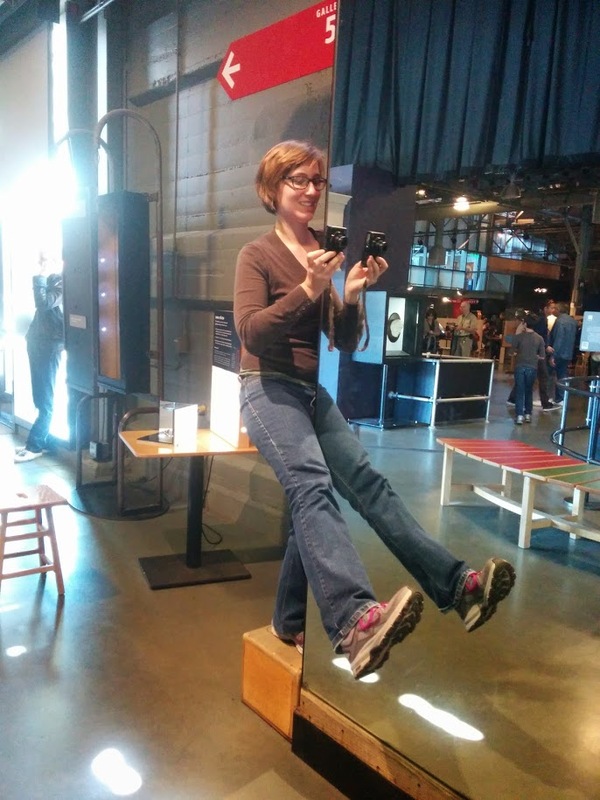 Friday afternoon, we ventured to Pier 15 to visit the Exploratorium. Robin-Lynn, Kristin, and I spent 3.5 hours in this place and only left because they closed. We played with all the exhibits. Ok, that’s a lie. We missed all sorts of exhibits in our short visit. We played with light. Kristin teaches graphic design so we talked about how the primary colors of light differ from pigment. 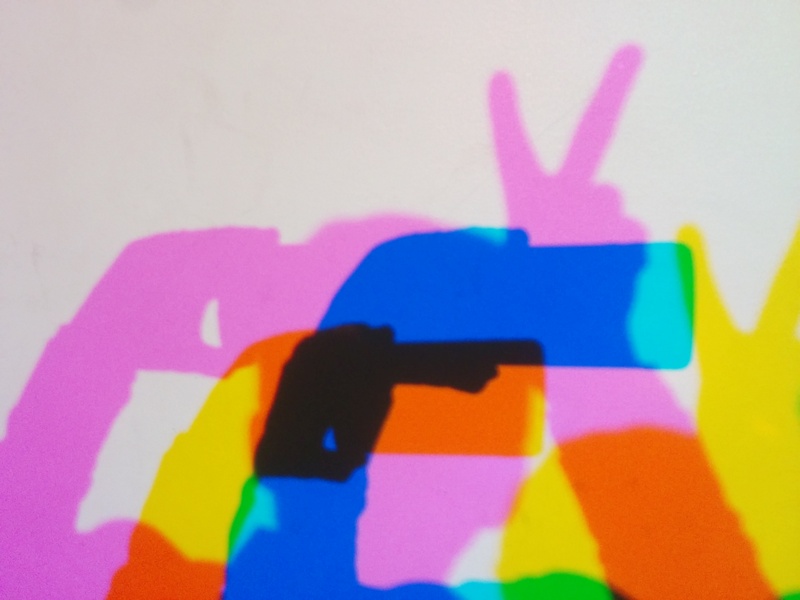 This simple shadow demo was fun. Kristin and I joked around with this illusion of flying. From her POV, the effect could be quite convincing. From mine, it was mostly hilarious. Robin-Lynn and Kristin made art at a huge swinging table. We wondered what it would take to recreate back in Atlanta — could it be scaled down? To give a sense of scale, the door on the right is about 2m tall. 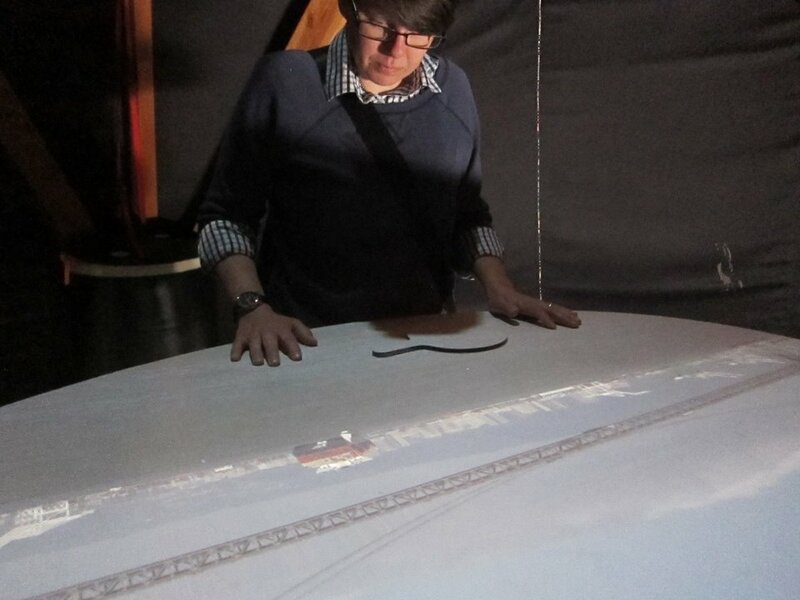 An aperture in the ceiling of the tent must’ve held a mirror to redirect light down onto this white table. Kristin didn’t mess with exposure much on this photo — the door was letting light in AND the obscura’s image was still vibrant. A reminder to always open with the hook, the thing of interest. We saw a gravity-powered calculator that could find square roots and a parabolic mirror that focused heat as well as light. Both would be great demos to show in my own physics classes. 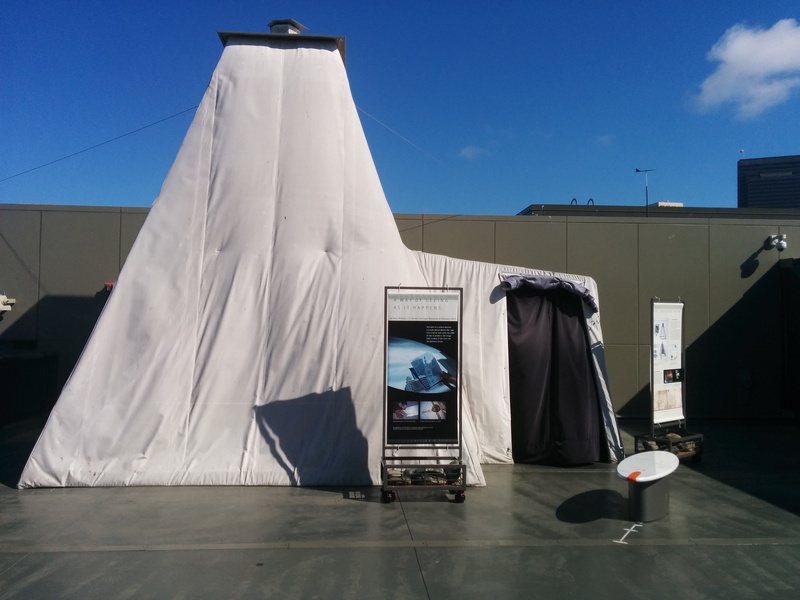 We can totally build a tent-based camera obscura in August. Meghan and Kristin say they’re down for the attempt. I think we need to use heavy canvas or something like velvet that’s light-tight. 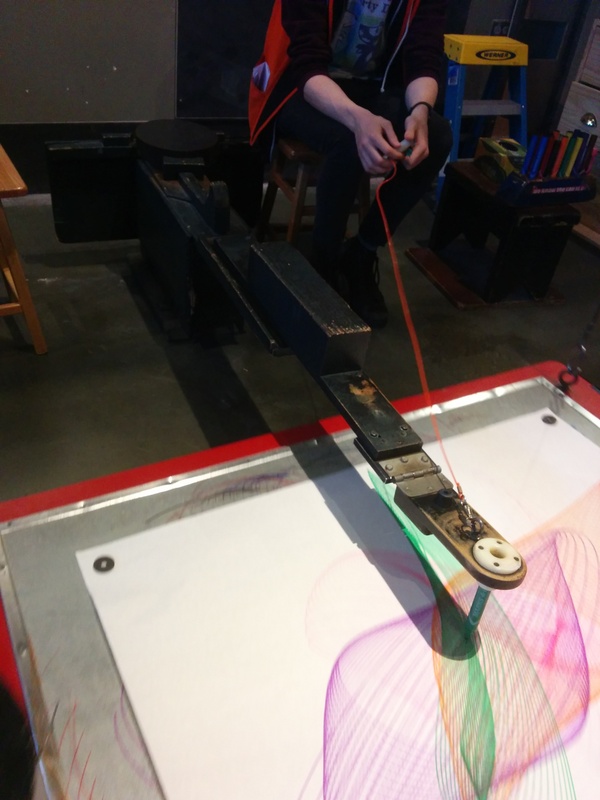 Exploratorium has a ton of free resources online that I need to explore: Geometry Playground, several iPad apps that I could use in the classroom — Sound Uncovered is one, and Snacks — aa way to create classroom versions of the most popular exhibits.